Since I never use my table and I know I have seen some others do this mod can someone direct me to how it was done and what materials I would need to source to get this mod accomplished. I did try the search but could not find it. Just wanting to do this as a joke for the wife since she enjoys her bubbly and is sometimes high maintenance with her 3 bags she brings on the boat. That's a riot, good one! Should be pretty simple, get a bucket, match the material (SS, alum) with the proper diameter pole material, and weld together. Seems like you should be able to use the factory table pole and just get a coupler that fits in place of the table - epoxy that to your bucket. Related (somewhat) question. Does my new LSV come with a table and does anyone use it? I can see where it would be handy but do you haul it around all day for the little time it is handy? And where does it store? Or just take it out on the days of just chilling? Ok a few related questions. I'd assume it is a standard feature. The pole is held by some clips in the long passenger side compartment and the table is strapped against the motor side of the passenger side compartment in the rear. I use my table more often than not. Great when the whole family is on board but take it down when riding with friends. I tried contacting the guy last year that did this on Wakeworld with no success. My plan this year is to just get a champagne bucket TIG welded to a table pole. I could use the pole to the boat's table, since we have never used it, but I'll probably try to source a nicer looking piece. I am going to measure the coupler that attaches to the existing table pole and more than likely epoxy it to a bucket. I might con a friend into welding it for me, I have zero welding experience but it is something I want to learn. I'm liking that. That piece would epoxy pretty easily. Obviously screwing wouldn't work since it would go through into the bucket and who wants to see screws at the bottom of the bucket? Seems a bit pricey for what it is - I'd like to do a bit of shopping around but I think I found a quick project. Still looking at the base. The one you posted is a good contender until you look at the shipping ($14); then you have a $33 base. $41.24 out the door...maybe a couple bucks more depending on if I have a good epoxy laying around. Back to the screws in the base, if you have ice in the bucket they won't show. If you have no ice, put a nice linen towel in the bucket and they won't show. Screws seem better than epoxy to me for this job. Someone will get drunk and knock the bucket off if it's just epoxied on. Is the base wider than the bottom of the bucket? 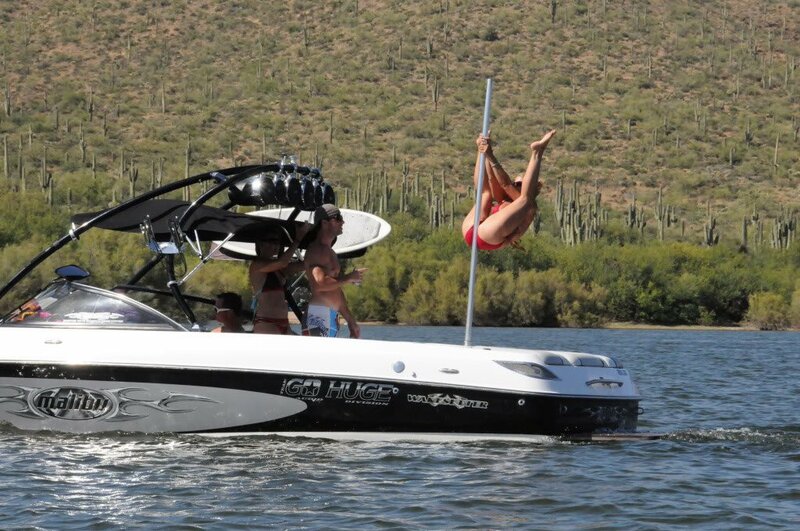 I always thought that would be a good spot for a stripper pole. There was a member on here named factoryKITTED that was fabricating exactly what you're looking for. I am not sure if he's active any longer, but it might be worth a shot to shoot him a PM and see if anything ever came to fruition with the idea.